What Is the True Cost of Living in Denver? 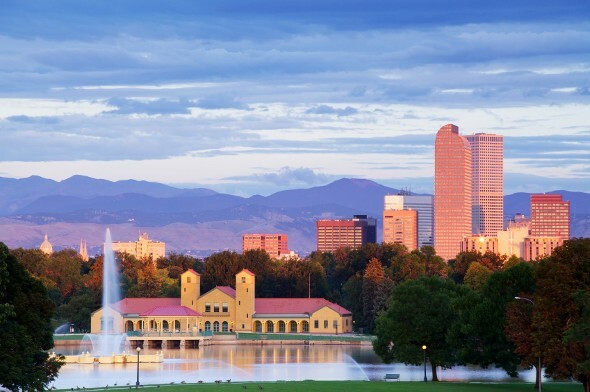 Nestled in the mountains of the American West, Denver has a lot to offer. For outdoor enthusiasts, Denver is a dream destination. And if you’re planning on training for a major sporting event, working out at Denver’s mile-high elevation will give you an edge. But will you be able to afford to live in this paradise? Let’s find out the true cost of living in Denver before you go west. And if you need some more help when you arrive, here are the top 10 Denver financial advisor firms. Between 2000 and 2015, the median sales price in Denver more than doubled. According to trulia.com, the median sales price for all residential properties in Denver in 2000 was $145,000. Today, it’s $320,000. In the last five years, Denver sales prices have appreciated 54.8%. 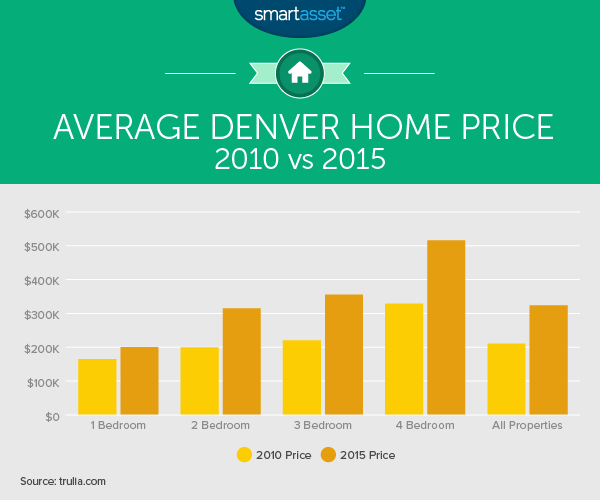 Take a look at the chart below to see how the real estate market in Denver has been performing in the last five years. Of course, it’s important to remember that past performance isn’t necessarily an indicator of future results. To see how much a mortgage in Denver may cost, check out our Colorado mortgage calculator. Not ready to commit to a mortgage? Prefer the flexibility of renting? According to myapartmentmap.com, you can expect to pay a monthly rent of $1,220 for a one-bedroom apartment and $1,592 for a two-bedroom apartment. Prefer to save money and live in a studio? The average studio rent in Denver is $1,133. These aren’t San Francisco prices, but they’re not bargains. Utility costs in Denver are below the national average. According to numbeo.com, a basic utilities package of electricity, heating, water and garbage for a 915-square-foot apartment costs an average of $128.45 in Denver. That’s around 19% below the national average of $159.24. Denver’s internet prices are also slightly below the national average. At $46.67 they’re just under the US average price of $47.52. Now that you’ve got an idea of how much lodging and utilities will cost in Denver, let’s talk food. A three-course meal for you and a date at a mid-range restaurant in Denver will cost you about $60. That’s 33% higher than the US average of $45. Want to grab a cappuccino before you commit to dinner? That will cost you $4.17 in Denver, around 12% more than the national average price of $3.73. If cooking at home is more your speed, the picture is mixed. In Denver you’ll pay above-US average prices for chicken breasts, tomatoes, eggs and wine. On the other hand, Denver prices are below the national average for apples, oranges, rice and lettuce. Still, you’ll save money by eating at home and skipping the restaurant meals. Denver residents famously love to run, hike and bike their way through life. But even the most active among us have other transportation needs. Denver’s monthly public transit passes are priced at different levels depending on whether you want local, express or regional service. For local service only, you’ll pay $79 for a monthly pass. Upgrade to express service and it will cost you $140. If you’re commuting from farther out and need a regional pass, expect to pay $176. Can’t imagine living car-free? According to gasbuddy.com, a gallon of gas in Denver costs an average of $2.76, 5% higher than the national average of $2.63. The good news is that Denver gas prices are below the average for Colorado ($2.78). What about car insurance? According to carinsurance.com, a resident of the downtown Denver zip code of 80202 pays an average annual rate of $1,243. Folks in Fort Collins, Colorado pay just $915. Residents of Denver are known for being health-conscious exercise-lovers, but everyone goes to the doctor sometimes, right? Let’s take a look at how healthcare costs in Denver stack up. 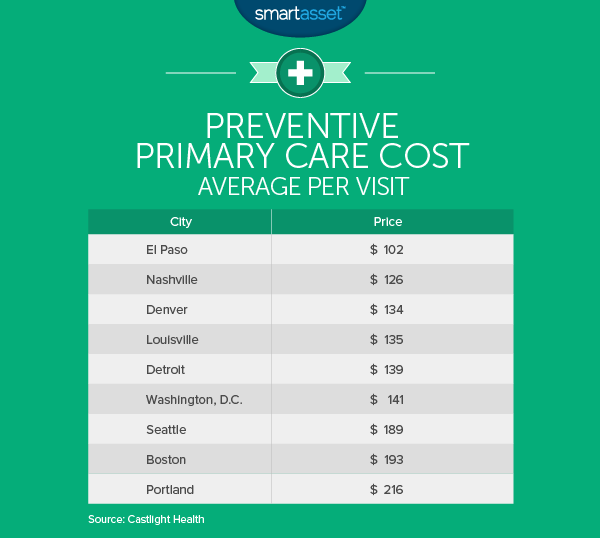 According to Castlight Health, a resident of Denver pays an average of $134 for a preventive primary care visit, with prices ranging from $120 to $205. Take a look at how the cost of primary care in Denver compares to other cities of a similar population size. If you’re moving to Denver, you want to be sure that your salary will enable you to maintain a decent standard of living. According to MIT’s living wage calculator, a living wage for one adult in Denver County, Colorado is $10.79. Unfortunately, that’s 35% higher than the statutory minimum wage of $8 an hour. The Denver living wage as calculated by the MIT researchers rises to $23.87 for one adult with one child and $28.51 for one adult with two children. Two adults who are both working need only earn $8.78. That rises to $13.11 if they have one child and $15.67 if they have two children. Knowing which banks offer what you’re looking for can be an arduous venture. So if you’re living in Denver and are looking for a new bank, check out SmartAsset’s top banks in Denver. Entertainment prices in Denver are a little above the national average. In Denver, a movie ticket will cost you $11.75. That’s 17.5% higher than the US average cost of $10. If you decide you need to keep up with your fitness-loving fellow Denverites, expect to pay about $40 a month for a gym membership. The good news is that that’s only 7% above the national average of $37.35. Last year, Denver residents approved an increase in sales and use taxes to fund city preschools. The city sales tax now stands at 3.65%. That may sound low, but it’s not the only component of the sales tax you’ll pay on purchases in Denver. Add in the state sales tax of 2.9%, a Regional Transportation District (RTD) tax of 1% to fund transit and a 0.1% Cultural Facilities District tax and you’ve got a sales tax rate of 7.65% in Denver. And if you’re wondering about one of Colorado’s more famous products, the sales tax on recreational marijuana is 10%. If you’re thinking about moving to Denver, it can be helpful to know how the change will affect your budget so you can plan accordingly. If you’ll be starting a new job, your paycheck may end up looking quite different than it does now. Try using our Colorado paycheck calculator to estimate what your new take-home pay will be.